You've probably heard lots of things about orthodontists and orthodontic treatment. Unfortunately much of the information you have heard may be untrue! Let's tackle ten of the top myths about orthodontics to make sure you aren't keeping misinformation from getting yourself or your children the treatment that's needed. Myth #1: An orthodontist is just a really expensive dentist. False! The truth is your family dentist and an orthodontist are very different! Both help in the overall health of your mouth, but that is where the similarity ends. Orthodontics is a specialized field of dentistry. In fact, an orthodontist has several more years of schooling after graduating from dentistry school. They receive advanced education related to the straightening of teeth and are trained to recognize issues and potential problems related to their field. *Note: Some general dentists have orthodontic training and qualified to do orthodontic treatment, you need to check with your dentist to see if this is the case. 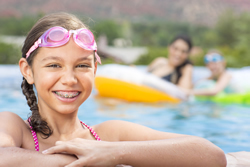 Myth #2: Braces are for kids only. False! Many adults believe that they can no longer receive treatment to straighten their teeth and get the beautiful smile they've always wanted. The truth is, around every one in five patients an orthodontist sees is an adult! You CAN get that smile you've always wanted! Myth #3: Orthodontics are only for straightening teeth and that's vain. False! While the majority of the patients seen are there for crooked teeth, orthodontists treat a variety of issues. Missing and impacted teeth, jaw misalignment, and overbite issues are all reasons you might see an orthodontist. Don't let the misconception that you are vain for wanting a beautiful smile keep you from seeking treatment. There is nothing wrong with wanting to love your smile! Myth #4: Braces are way too expensive for me. False! Money talk is never fun, but that's why you need a great orthodontic office like Reese Family Dentistry for your orthodontic treatment. The caring staff there can walk you through the process and show you that orthodontic treatment is affordable and worth it. There is a plan perfect for your budget. Myth #5: Traditional braces are the only option. False! Technology continues to change the world every day and the field of orthodontics is no different. Many people still continue to use the traditional method, but there are other options now. Invisalign clear aligners are now readily available. Ask your orthodontist about it! Myth #6: Orthodontists are only for super complicated issues. False! An orthodontist is trained to recognize both small and big issues. Often times it's actually better to seek treatment before a small issue transforms in to a big issue! Myth #7: All I need is to get braces on and my teeth will be perfect. False! Braces take effort! Regular brushing and flossing is essential to getting your teeth where you want them to be. Also, once your braces have been removed, you will more than likely be wearing a retainer. Wearing a retainer at night is very common. Once your teeth are straight, you have to do things to keep them that way. Myth #8: I'm going to be stuck with braces forever! False! The idea of changing your eating habits and taking on the responsibility of caring for braces can seem overwhelming. Many people are also under the assumption that you'll be stuck in the braces for years. There's no one size fits all plan when it comes to “ortho” treatment. The more you listen to your orthodontist and take good care of your teeth, the sooner the process will be over. Myth #9: Braces are super painful and inconvenient. False! Many believe your wires have to be super tight and changed at every visit. That's not the case. The wires are only changed on occasion and they are much more flexible and comfortable than in years past. Once you get used to them being there, you'll hardly notice them! Myth #10: You can switch orthodontists at any time once the treatment has begun. False! Sometimes circumstances, such as moving, are beyond your control and you'll need to seek a new doctor. If at all possible, it is best to use the same person throughout the time of your treatment. Each orthodontist is unique and it's good to remain with the one who knows your situation. How about one more just for fun? Myth #11: Your mouth will be so full of metal that you will be sucked to any very large magnet!! False! While that might be funny (but painful!) the metal used in braces is actually non-magnetic, so the chances of that happening are zero. If you have any questions or need help on making a decision about seeking orthodontics in Mountain Home, Arkansas call Dr. Reese's office at 870.424.5900 and make an appointment today!